You know it’s about to be a new year, and some of us will be setting goals to do certain things. It’s been about 3 years now, and I’m still working on a goal I made and accomplished. I made my goal, in fact I did a little better than I expected. It was hard work, and still takes a lot for maintenance. Oh, I’m talking about the dreaded weight loss goal. I’ve always been a person who has exercised regularly, and thought for the most part I was eating healthy. As I became a woman of a certain age, I was like most people–I needed to do something different. So at the time I was exercising with Marsha, who owns So Fit, and she was constantly telling us to watch our diet, and of course we told her we were–kinda sorta, not really. Since I was exercising I decided to do something different, I joined Weight Watchers on January 6, 2011 and made my goal and became a life member on December 1, 2011. I’ve changed a lot of things while still maintaining my goal weight. This year, our exercise group disbanded, and now I exercise with Ed who owns Impressive Fitness. I still continue to walk with my friends, do walks for charity events, and attend other exercise classes when I can. I’m still doing the Weight Watchers thing, and just about a month ago decided to do a fast–eating meat only twice a week. My pastor said Saturday and Sunday, but I’ve changed that to whatever two days I want because it is the holiday season, and there are parties. Getting more sleep or what I consider to be better sleep has become a must for me. I purchased an adjustable mattress with massage features. I can truly say I sleep well while trying to get at least 7 or 8 hours a night. My weight loss is visible. 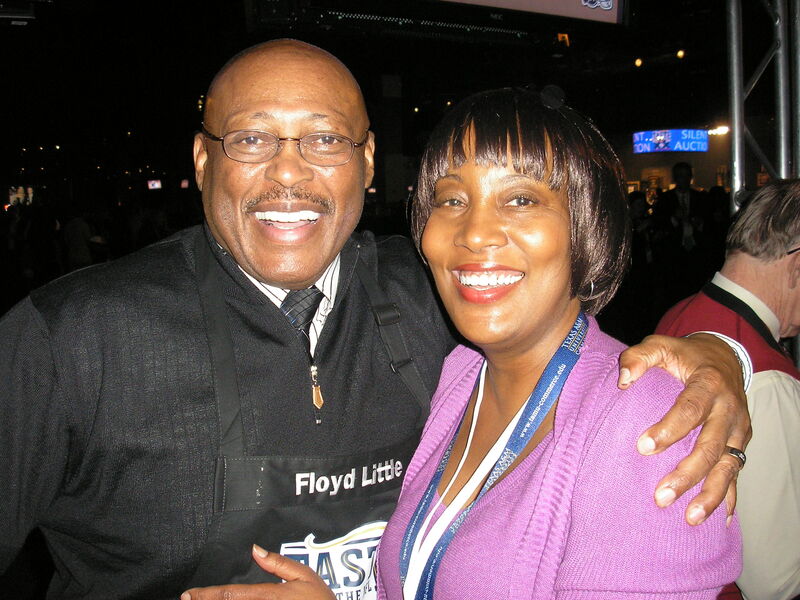 Here I am with Pro Football Hall of Famer Floyd Little at the Taste of the NFL during the Super Bowl in February 2011. 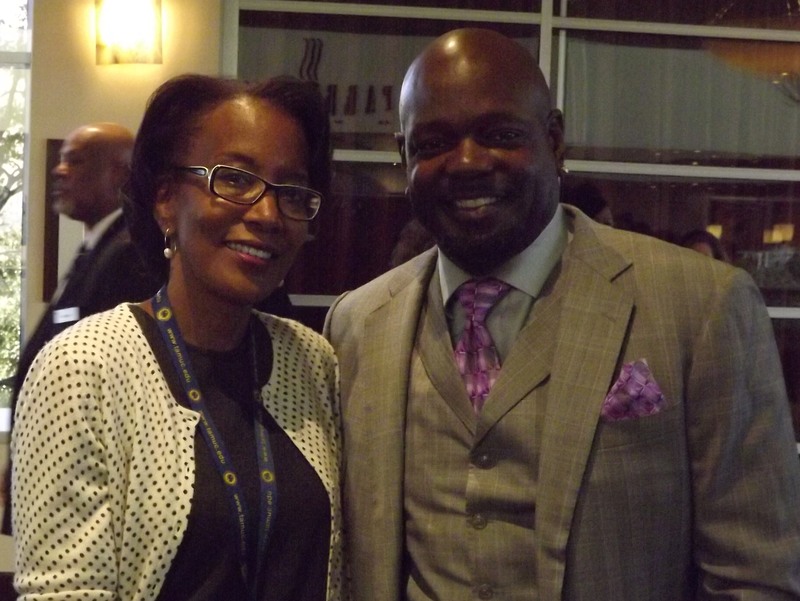 The next picture is a smaller me with Pro Football Hall of Famer Emmitt Smith at the Treasure You Second Chances for Overcomers Awards program in January 2014. Either the players were getting smaller or I was. Do I think that I was too big, probably not, but I wanted to be back to my fighting weight. Do I like to exercise? Do you? I do feel better when I do exercise, and when I eat better. Take a look at the article below explaining why women of a certain age may have a harder time when it comes to losing weight. The article is written by Ms. Yagana Shah. You can follow her by emailing her at: yagana.shah@huffingtonpost.com. Remember “thisisyourbestyear”. You can have your cake and eat it too–you just have to exercise and watch how much cake you are eating. Next Post And The Winner Is. . . . . .